Our first week's CSA share arrived last Monday with purple and green heads of lettuce, white and red bulb onions, heads of garlic, mint, and garlic scapes! For those who not been following along on the CSA Insider or social media (@nutritiondmp), join us! We want to hear what recipes and information you want to learn about! Plus, we give you tips and information to use local produce before it comes out on the blog. Onions, garlic, lettuce, and fresh mint are fairly familiar foods we use. But did you know that you can freeze onions and garlic? Don't need all the onions your CSA gave you? Chop and freeze your onions to use in cooked dishes later! The National Center for Home Food Preservation and the Cooperative Extension out of University of Nebraska–Lincoln both have instructions on how to freeze onions. The National Center for Home Food Preservation states that freezing garlic may yield undesirable flavors. If you want to freeze garlic – particularly if you have a lot from your CSA – this handout from North Dakota State University Extension Service has instructions. 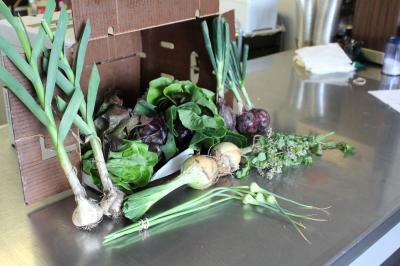 The garlic scapes were an unexpected addition to the CSA box this week, and really fun to learn about! Garlic Scapes: What are They? What to Cook? In his article, fellow UI Extension educator, Grant McCarty, shares that "garlic scapes are the immature, flowering stems of hardneck garlic." Scapes have a milder flavor than cloves of garlic, but can be used anywhere you use garlic. The University of Kentucky recommends storing scapes in the refrigerator for up to a month. From there, scapes can be frozen, either raw or blanched before freezing. For extra flavor, add cooked bacon to the salad. Use the bacon grease for part of the oil. 1. Whisk together oil, vinegar, sugar, and black pepper in a small glass measuring cup. 2. Microwave for 30 seconds or until mixture boils. 3. Pour hot dressing over lettuce. Toss to coat. Dress with a soft cheese, like feta, or a handful of walnuts. 1. In a large bowl, add lettuce and top with minced garlic scape and mint. 1. Whisk together mint, lemon juice, oil, and honey in a small glass measuring cup. 1. Place all ingredients into a food processor or blender. 2. Process together until a smoother consistency. 3. Serve with whole wheat pita bread, pretzels, or veggie sticks. 1. Add tea bag to hot water. Let steep for 5 minutes with mint. 2. Remove mint and tea bag. Pour over a glass with ice.